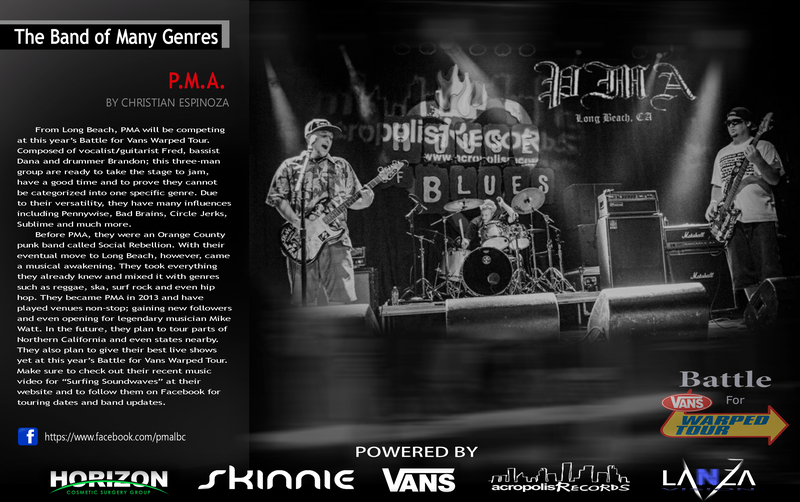 From Long Beach, PMA will be competing at this year’s Battle for Vans Warped Tour. Composed of vocalist/guitarist Fred, bassist Dana and drummer Brandon; this three-man group are ready to take the stage to jam, have a good time and to prove they cannot be categorized into one specific genre. Due to their versatility, they have many influences including Pennywise, Bad Brains, Circle Jerks, Sublime and much more. Before PMA, they were an Orange County punk band called Social Rebellion. With their eventual move to Long Beach, however, came a musical awakening. They took everything they already knew and mixed it with genres such as reggae, ska, surf rock and even hip hop. They became PMA in 2013 and have played venues non-stop; gaining new followers and even opening for legendary musician Mike Watt. In the future, they plan to tour parts of Northern California and even states nearby. They also plan to give their best live shows yet at this year’s Battle for Vans Warped Tour. Make sure to check out their recent music video for “Surfing Soundwaves” at their website and to follow them on Facebook for touring dates and band updates.